When Josh's mother dies in a phobia-induced car crash, she leaves two questions for her grieving family: how did a snake get into her car and how do you mourn with no faith to guide you? Twelve-year-old Josh is left alone to find the answers. His father is building a time machine. His four-year-old brother's closest friend is a plastic Power Ranger. His psychiatrist offers nothing more than a blank journal and platitudes. Isolated by grief in a home where every day is pajama day, Josh makes death his research project. He tests the mourning practices of religions he doesn't believe in. He tries to mend his little brother's shattered heart. He observes, records and waits—for his life to feel normal, for his mother's death to make sense, for his father to come out of the basement. His observations, recorded in a series of journal entries, are funny, smart, insightful—and heartbreaking. His conclusions about the nature of love, loss, grief and the space-time continuum are nothing less than life-changing. "This novel's refusal to sentimentalize loss or to accept quick or predictable solutions in conjunction with its ability to create a realistic and complex protagonist allows for a refreshing perspective on the story of the loss of a parent." "An original and entertaining take on grief and coping with loss...[Josh] is easy to relate to and sustains this story with his strong, thoughtful and funny voice." "A charming and sometimes whimsical story." 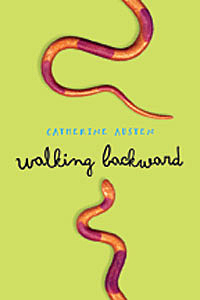 "The characters in Walking Backward are human, quirky and likeable...Josh's narrative perspective gives it humor and emotional honesty...An appealing book and a good pick for understanding the loss of a parent." "Throughout his emotional journey, Josh's voice is both natural and believable. Austen is both unsentimental and unapologetic in her employment of precise and elegant prose, and the complicated and often humorous reactions to grieving practices lend themselves to an enjoyable read." "This will appeal to young people looking for a sad novel, as well as those wanting to relate to another's trauma...A definite success. Recommended." "Will resonate with those who have experienced a loss, even one not as traumatic as the loss of a mother, and its gentle portrayal of the stages of grief will strike a chord with those who are starting to think about the big questions of life and death and loss." "Josh's wise-beyond-his-years voice will admirably answer the call when young patrons ask for 'sad' books and also provide counsel when young people must deal first-hand with the loss of a loved one." "As Josh struggles to understand his family, moments of great tenderness and emotion emerge…Josh comes to accept that dealing with loss is a messy, frustrating, and painful matter that cannot be avoided through mere ritual." "Austen comments - subtly, non-judgmentally - on the secular, nuclear nature of the contemporary North American family… Her writing cuts straight to the heart. She delivers a wise, rich novel, wonderfully compelling for children and adults alike." "Differs from most bereavement stories in both its male narrator and its genuine, if quiet and rueful, humor… The result is a book that perceptively gives weight to the small as well as the large ways bereavement can change a family and grief can intermix with the continuation of life." "The dead-parent genre is a busy one, but Austen breaks from the pack with this confident and peculiar debut… Austen is more interested in people's alternately funny and haunting reactions to grief… Austen is unsentimental about anger and regret, and that alone makes this a refreshing change of pace." "Austen's protagonist is an endearing blend of smart-aleck and lost boy. The story - recounted in journal entries - deftly tackles such weighty topics as atheism, grief and the ties that bind a family together." "Satisfying and realistic. This book would be a good catalyst for discussions about the impact of phobias or dealing with grief. Recommended." "In this impressive debut novel, Josh keeps a journal to chart his feelings and thoughts, allowing readers to follow his journey from sadness to acceptance and the eventual return of cohesion in his family. Given the subject matter, the story is never maudlin, and Josh's voice rings natural and true. An elegantly crafted volume of lasting power." "Josh's sense of humour, which lightens the somber subject matter of this novel, comes to light throughout the book...While professionals may find this novel useful as bibliotherapy, Walking Backward is much more than a therapeutic tool. With its well-drawn characters and depth of understanding, this work of children's literature should withstand the test of time...Highly Recommended."